Dec 9 The power of consistency, or how not to annoy picky consumers! We are surrounded by translations, and quite often, we do not realize it! Much to blame for this is that translators often do a great job, and the text we read seems to be written originally in that language! To me, that's the litmus test of a great translation; not being able to detect the source language. But there are other occasions in which the adaptation of one language to another is not so unnoticed, and yes, I understand that not everyone focuses the same attention to translations as I do. But sometimes, the translation confuses me so much that it prevents me from enjoying what I am doing at that moment! One of those moments was yesterday, enjoying a long weekend I downloaded a new game that I saw in the Apple Store. The other day I went to the Store to buy a case for my iPhone, and there was a car game that looked great! the different models of the cars had a surprising level of realism, the circuits really seemed real! and the multiplayer mode worked very well! Without lag! ... But the translation ... OMG! Another clear example of investing a lot of time and resources in the development of a great app (a game in this case) and then not paying attention to the language. The translation of the game was excessively literal, rigid, nothing fluid ... but what really knocked me down was the continuous inconsistency in the menus! Sometimes the button to see my car was called "coche", or"vehículo", another time they referred to it as "auto" and I even saw "carro", oh no!!! 4 translations for the word "car", even mixing Spanish Spain "coche" with Spanish South America "carro" ... and while I was seeing that mixture of linguistic inconsistencies I kept asking myself .... But why is glossary management one of the basics of our industry and still many cases in which no attention is paid to the glossaries? 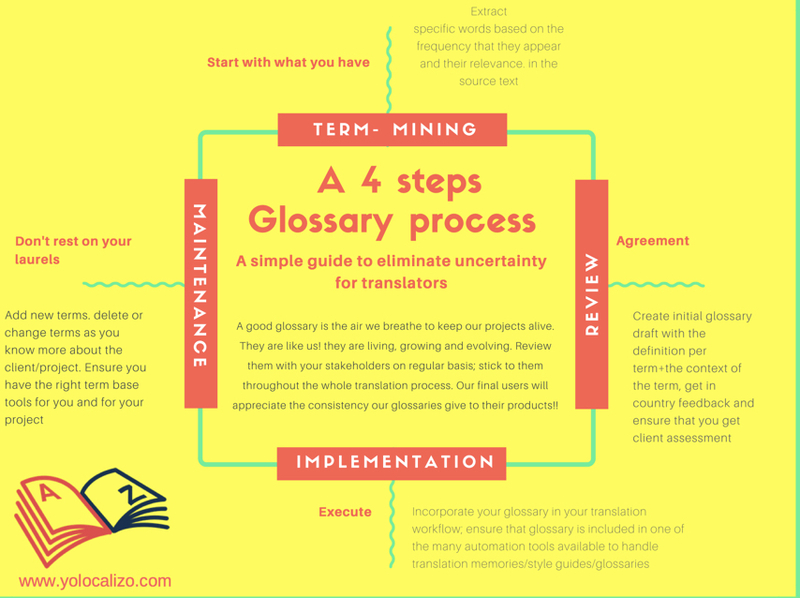 Glossaries in the translation industry are essential to create consistency, to create a brand image, and mistakes in the creation and maintenance of the glossary have many negative connotations. Despite all these reasons why it is worth paying attention to the glossaries, and despite being one of the basic and fundamental processes to produce a good translation, sometimes, I do not know if mistakes like those I saw in the game is due to the fact that the creation/maintenance process is not clear or if it is for some other reason. 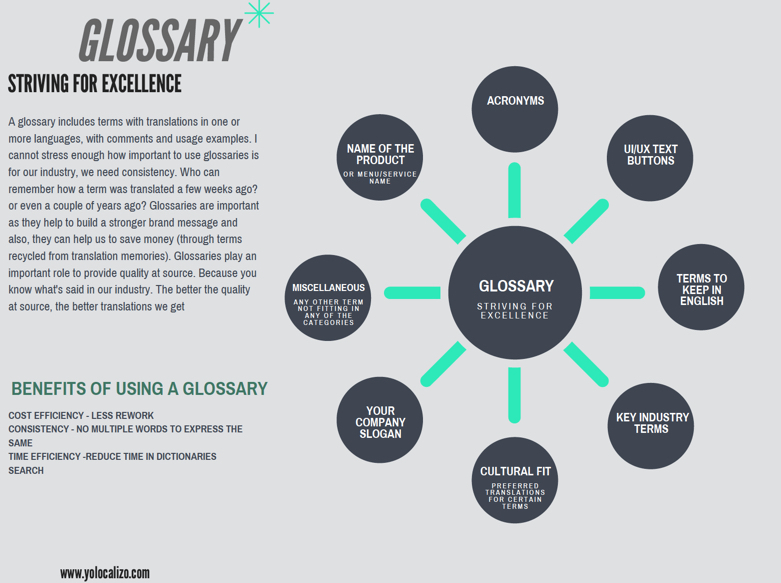 My post this week is around this topic, it is about the process of creating/maintaining a glossary and what we should include in a glossary. I have prepared these beautiful 🙊 2 infographics that I hope you find useful! because .…. although the world is full of translations, and we do not notice them most of the time, when we do, the product may not like us. This was my case, I deleted the game from my mobile phone, despite the great graphics it has, and the good gameplay it has. Hope you find this post useful! And please share below which are the best practices you follow to provide top-notch glossary processes! Dec 15 I refuse to accept that localization is a commodity! Dec 2 Signal vs Noise. Using KPIs to improve Localization; my thoughts after collaborating in a nice Webinar!